Diono Baby OrganizerThe Diono Baby Organizer organizes all your baby essentials for parents on-the-go! 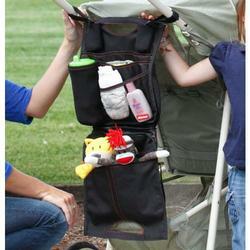 This stylish 3-in-1 organizer contains 4 various sized pockets including an insulated bottle holder. Unzips on both sides to hang flat from the car seat headrest. Features a shoulder strap for easy carrying.